Our Tofino Kayak Tours are sure to offer an unforgettable kayaking experience in spectacular Clayoquot Sound, a world renowned mecca for sea kayaking. Immerse yourself in the extreme natural beauty that surrounds you. 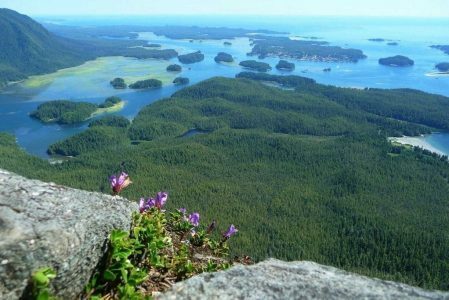 Bask in a temperate coastal rainforest, one of the largest left in the world. Enjoy a pristine marine environment teeming with life. At Paddle West Kayaking, we’ll make sure your Tofino Kayak Tour is one of a kind. On our “Discover the Islands” kayaking tour you’ll explore beautiful Tofino shorelines and island channels while enjoying the breathtaking sights of Tofino’s surrounding waterways. This is the perfect kayak tour if you only have a couple hours but still want to experience the scenery and wildlife Tofino is famous for. Our “Discover Clayoquot Sound” kayaking tour is the perfect way to escape the crowds and discover the breathtaking natural beauty of Tofino’s Clayoquot Sound. 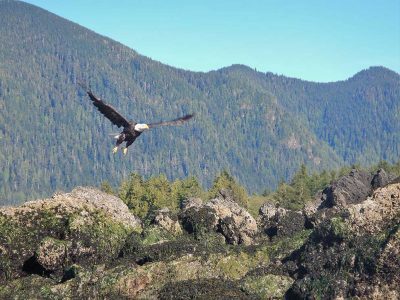 Whether kayaking along the beautiful sandy shores of Vargas Island or paddling up Lemmens Inlet surrounded by the towering old growth of Meares Island; our Discover Clayoquot trip will leave you with a sense of awe for one of the worlds premiere sea kayaking destinations. This tour offers great value, and is highly recommended for those with a decent level of fitness who are looking for a bit more time to explore this amazing environment. Each trip involves about an hour on land to rest, have lunch, and explore. On our “Discover the Night” kayak tour, discover what it’s like to gaze out upon a starlit night far away from the lights of populated urban areas. Depending on the time of year we may see bioluminescence that dance and sparkle the water green at the stroke of your paddle, or meteor showers lighting up the nights sky above. This unique kayaking tour is offered during select times of the year in Tofino.